The Washington Post has shared a video of their site which claims to show a TOW missle being launched at a Russian built T-90 MBT. In the video, which was posted to YouTube Friday, Syrian rebels appear to have filmed themselves firing for the first time a U.S.-made TOW anti-tank missile at a Russian T-90 tank. According to the video’s caption, the TOW strike occurred in the Syrian town of Sheikh Aqil, a suburb just northwest of Aleppo. In November 2015, the tanks appeared well to the east of Latakia, near Aleppo. Around the same time, a report from Al-Masdar Al-‘Arabi news indicated that a small detachment of T-90s was given to a Syrian Army mechanized unit to help with current offensive operations in the region. In recent weeks, the advanced battle tanks were filmed during a CNN segment on the outskirts of Raqqa. In the video, the missile appears to strike the turret of the tank. As mentioned on other blogs, the T-90 appears to be equipped with a Shtora–a device designed to disrupt incoming wired-guided and infrared guided missiles, much like the TOW. In this case, it appears the system failed or wasn’t active. Though the video shows the tank’s crew member bailing out, it looks like the strike did not penetrate the turret and potentially glanced off. T-90 tanks are covered in what is called “reactive armor.” The armor serves an outer shell to the tank’s hull that, when struck, counter-detonates to disrupt the flight of the incoming enemy missile. Reactive armor can be mounted on various other tanks and is not unique to the T-90. However, the T-90’s reactive armor is likely a more advanced version of the types found on older Russian and Syrian tanks. Russia Beyond the Headlines is reporting that Algeria last year signed a $1 billion dollar deal to purchase 200 knockdown kits of Russian T-90 tanks. These vehicles will be assembled at an Algerian tank repair facility. 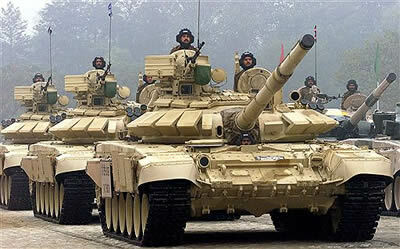 In addition, Algeria ordered kits to modernize approximately 300 T-72 tanks procured in the Soviet period. The Algerian shift from direct procurement of tanks from Russia to their licensed assembly on the national territory is comparable with the Indian policy in military-technological cooperation with Russia. Read full article here.